Breakfast has always been an important meal for me. Without it, I start feeling weak and lethargic halfway though the morning. So I always make sure to eat it. It never has been fancy though, cold cereal, oatmeal or a bagel are pretty average breakfasts for me. But honestly I don’t enjoy breakfast foods all that much. I would rather have a meal of spaghetti, hamburgers or grilled cheese. But who has time for that in the morning? Not to mention, its not a healthy start to the day. Last Saturday, I had some time to do some meal planning for the coming work week and included some breakfasts. I decided to make some granola. 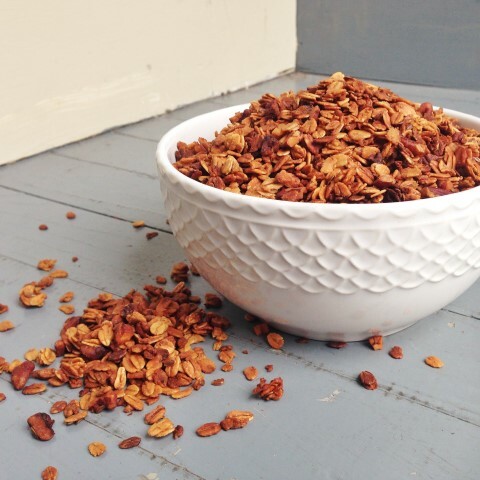 Granola is a traditional breakfast food I like, and it is so much cheaper to make. This recipe involves just a few ingredients. Oatmeal, flax seeds and pecans make up the bulk. The highlight is the chai flavor. Not strong, but enough to remind you of that sweet, delicious cup of tea. I never liked tea at all until my trip to India. There I would politely sip the cup of chai they hospitably handed me every morning. By the end of the ten days I was there, I was pretty much an addict. But, they don’t make chai in the United States like they do in India. They just can’t get the blend of spices right. I wish everyone could get the chance to go to India and try some real chai. Add the honey, cinnamon, vanilla extract and chai tea to the melted butter. Let cool to room temperature. Preheat oven to 350 F.
Pour the butter and honey mixture over the oatmeal and toss together. Spread mixture into a thin layer on a lightly greased cookie sheet. Bake at 350 F for 45 to 60 minutes, stirring frequently. Watch it closely to make sure it doesn't burn. Store tightly covered. Serve with milk or yogurt. Thanks for the opportunity, Rachael. I would love too. I REALLY want this for a snack right now 🙂 Looks so good! I love the idea of Chai flavors. We always have a ton of Chai in the house since my hubby is from India. I love the stuff. He would really like this recipe too. 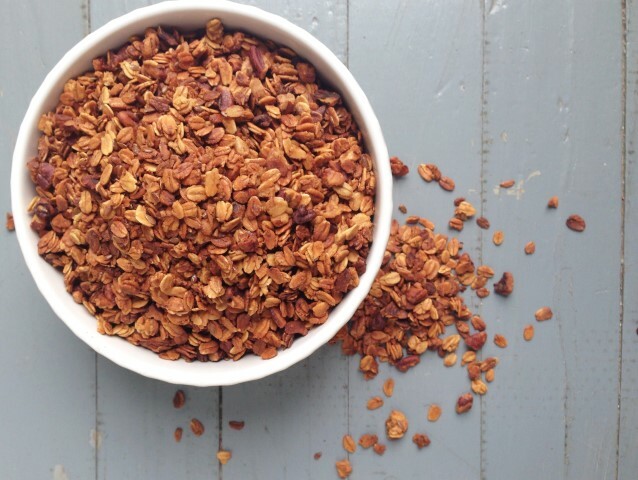 Yum, I love granola – wishing I had some for breakfast! I’m really excited that you shared your recipe! 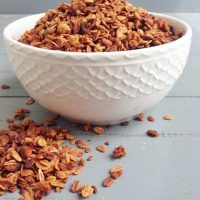 I love, love, love chai, and try to make it myself (although I can only imagine how amazing the original must be), and am a collector of granola recipes. What a great combination! I’m going to love this – I can already tell! 🙂 Thanks for sharing. 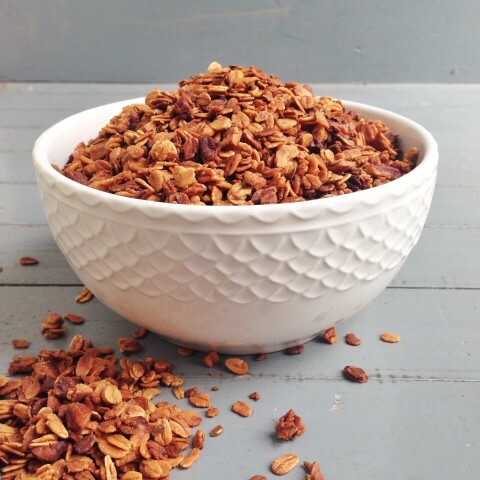 I would love to see your collection of granola recipes! Maybe a blog post idea for you! Hi Mallory – This looks delicious. Thanks so much for sharing with the Let’s Get Real party. I’m pinning it to our group Pinterest board. Visiting from Turn It Up Tuesday. I love granola and chai tea, what a lovely combination. I co-host Sweet and Savoury Sunday and would love for you to stop by and share this and other recipes with us. Have a great day! This sound like a delicious combination of flavors! 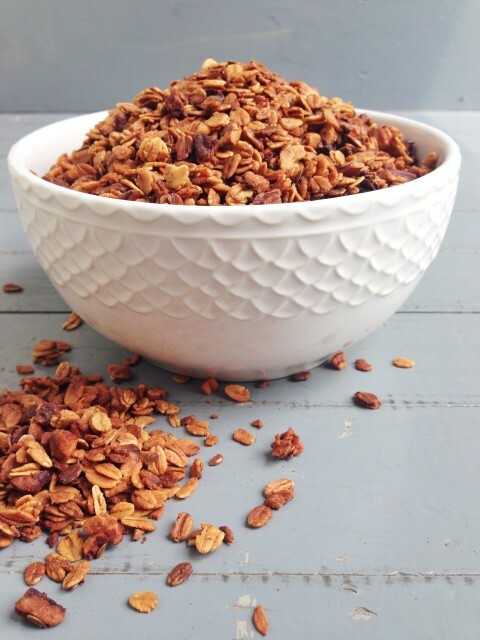 I love homemade granola too. Thanks for sharing at my Creative Ways Link Party. I hope you’ll be back to link up more on Wednesday night. I can read this recipe and KNOW it will be delish! Making this today – what a fantastic idea on the ingredients!